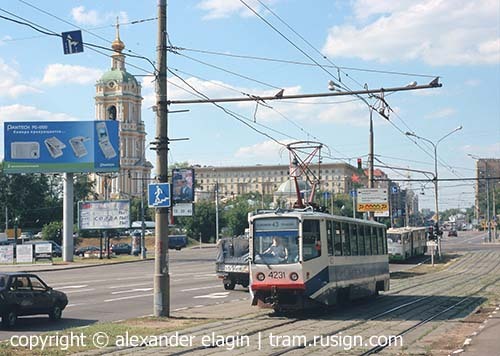 A tram line from Krestyanskaya Zastava to Simonovo was constructed in 1913. In 1930's new lines were built from the main line towards new factories in Dubrovka district. Today this line, although shortened in 1987 and doubled with a Metro line in 1995, still has a high patronage because it is a very convenient way of transportation. January 1976 was one of the last months of the line in its original alignment. The district had already been sanified and new high-rise buildings had been erected instead of old wooden shanties. A few months later the line would be relocated to a new place, leaving the street empty. The same place three decades later. The street, once a trunk road, became a blind alley and surrendered traffic to a new highway. 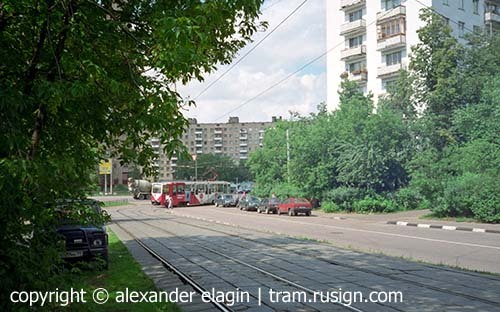 The tracks were moved to a newly cut Novospasskiy Proyezd in 1976, where the line remains up to date. The ubiquitous billboards partly hinder the belfry of Novospasskiy monastery. Novospasskiy Proyezd makes up only a stretch of the highway, while the next stretch is named Simonovskiy Val. 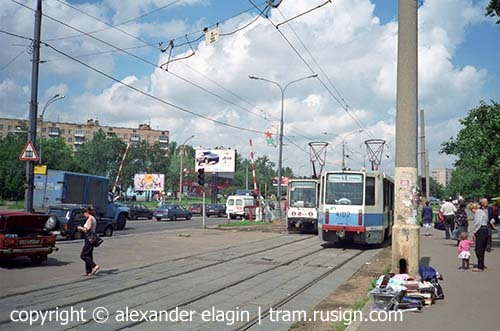 A railway branch crosses the tram tracks and the road. This place is unique for Moscow: railway level crossing with wide highway. 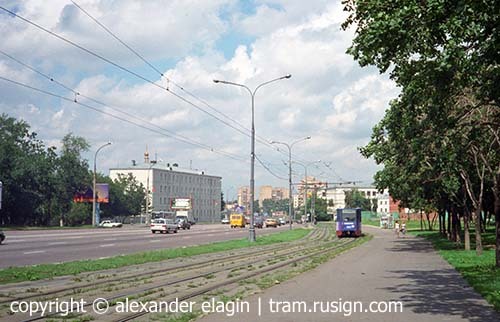 In a few dozen metres beyond the railway crossing the tramline turns from Simonovskiy Val to Sharikopodshipnikovskaya Street (in this photo). 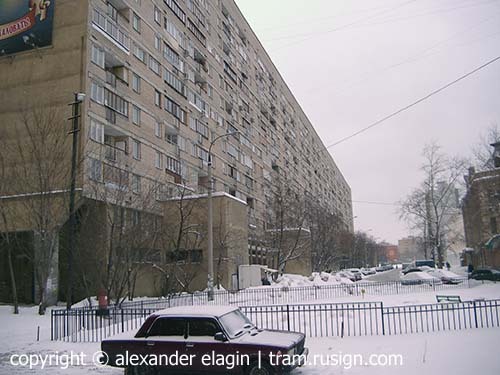 Until 1987, the line also continued along Simonovskiy Val and then went to a vast industrial district Simonovo. 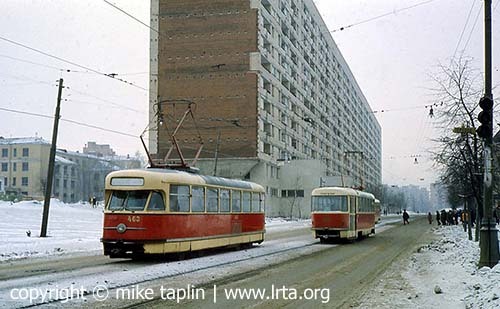 In 1987 it was closed because there were plans to convert a street where tram had been into a pedestrian-only lane, but the plan appeared fruitless; yet the tram tracks were lifted for good.